Sunday! Sunday! Sunday! 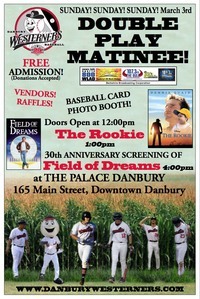 March 3rd, join Danbury Westerners Baseball and The Palace Danbury for the Sunday Double Play Matinee - a event including raffles, vendors, a baseball card photo booth, and FREE showings on the big screen of the baseball movies, "The Rookie" and a 30th Anniversary Celebration of “Field of Dreams." "The Rookie" is a G rated 2002 American sports drama film directed by John Lee Hancock and produced by Walt Disney Pictures. It is based on the true story of Jim Morris, a Texas baseball coach makes the major league after agreeing to try out if his high school team made the playoffs. Morris, would go on to have a brief, but famous Major League Baseball career in 1999–2000. The film stars Dennis Quaid, Rachel Griffiths, Jay Hernandez, and Brian Cox. "Field of Dreams" is a PG rated 1989 American fantasy-drama sports film written and directed by Phil Alden Robinson, adapting W. P. Kinsella's novel Shoeless Joe. It is the story of an Iowa corn farmer, who after hearing voices, interprets them as a command to build a baseball diamond in his fields; he does, and the 1919 Chicago White Sox come. It stars Kevin Costner, Amy Madigan, James Earl Jones, Ray Liotta and Burt Lancaster in his final film role. It was nominated for three Academy Awards, including for Best Original Score, Best Adapted Screenplay and Best Picture. The event will have raffle items from local businesses, including the opportunity to win throwing out the first pitch at a Danbury Westerners Baseball game, as well as being a Bat boy or girl for a game, and more.